Casting is a key sea angling skill, and reaching long distances with bait gives the shore angler an edge when it comes to catching bigger and more fish, especially during winter when weather and sea produce the worst possible conditions. Getting baits to reach maximum distance involves using heavy 5oz or 6oz lead weights and low diameter lines between 12-15lb breaking strain or 0.32-0.35mm diameter. The heavy lead and light line combination offers the least resistance to wind and gets the best performance from the reel. However, this formula creates a problem in that the low breaking strain/low diameter line can easily be snapped by heavy leads and large bait loads, so a short length of thicker, stronger line is used at the head of the mainline – this is called the shockleader. The job of the leader is to deal with the massive load put on the line during the build-up stroke to the cast and final release. A standard 15lb line wouldn’t be able to cope with the massive pressure and would part halfway through the build-up. This would be dangerous, if not potentially lethal. A leader acts a safety net for anglers firing out a lead weight over 3-4oz on all lines under 30lb. 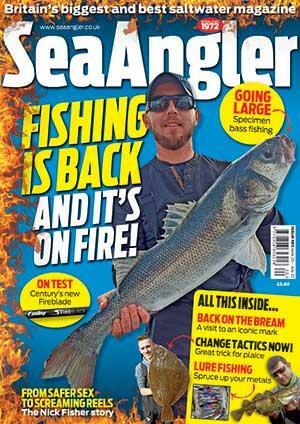 Any sea angler not using a shockleader when casting from a beach or pier is irresponsible. The problem with a shockleader is that you need to know how to join the heaver leader to the thinner mainline, which is a potential weak link if you get it wrong. If tackle gets snagged, the leader knot is most likely to break and that means losing the complete shockleader as well as the rig and lead weight. You don’t want to be doing that every cast because it will ruin your fishing and cost you money. Some novices get fed up with losing tackle and tying knots and don’t bother with the leader. This is a big mistake, and you should never cast a big lead and bait directly off a 15-20lb mainline. But read on, because we are going to show you simple ways to tie leaders without losing your temper. The strength of your shockleader is dictated by the weight of the lead you are casting and your casting style. The oft-quoted formula for leader breaking strains is 10lb for every ounce of lead cast. In other words, a 5oz sinker needs a 50lb shockleader and a 6oz lead needs a 60lb line. For power casting styles that involve generating compression in the rod and more speed in the lead, which is achieved by swinging the lead in a wide arc (pendulum), then a further 10lb is usually added to the overall leader breaking strain as a safety cushion. There is an allowance for common sense here. There is no comparison between a full-blooded power pendulum arc on the tournament field and a simple back swing from the pier or beach. On the field the lead in not encumbered by rig, bait or wind direction and can therefore generate awesome power and more danger. On the beach a baited rig, the awkward stance, surrounding obstructions, a strong wind and unsure footing all reduce the power input, but can heighten the dangers. For short-range rock fishing, or where less powerful overhead casts are used, it is possible to reduce the shockleader strength safely. Anglers using Continental-style overhead casting methods use leaders as low as 40lb. Even when you take precautions things can go wrong. Line damage, a thumb slipping off the reel, losing the grip of the rod or simply slipping over during the cast can all result in accidents. Tying two lines together that differ greatly in diameter requires a specific knot, and there are a number used within sea angling circles. Here are some of the main knots that are used. They vary in simplicity and strength. A streamlined and fairly strong knot which is popular among boat anglers. On the shore it is considered strong but bulky and is also used for joining mono to braid, although it needs at least four/five turns and the mono to be blobbed with a lighter flame. How to tie: Lay two lines alongside each other. Tie a three-turn grinner in the leader around the mainline. Tie a five-turn grinner in the mainline around the leader. Tease the knot tight, cut and blob ends. Ideal for beginners because it is simple to tie, it creates a small neat joint and the cut ends of the knot face away from the rod rings when the knot passes through them. This knot has been popular with field casters for many years because of this. From an angling standpoint it is not the strongest of the leader knots, although it is adequate for clean ground. It is not a good choice on rough, mixed or snaggy ground, though. How to tie (below): Start by making an overhand knot in the leader line (yellow). Pass the mainline through the loop (pic 2) and twist around the leader six times (3). Turn the mainline back on itself and pass through the gap you have created between leader and mainline three times and back out through the overhand knot (4). Tease tight slowly (5), cut and blob ends carefully (6). Perfect for braid to mono joins of any kind and can also be used to link lighter shockleaders. Not so good with leaders above 50lb. How to tie: Form a lasso in the braid mainline (1) and lasso the mono leader (2 & 3). Then tie the mono as you would the uni leader knot (4). Cut and blob mono (5). This is a small neat knot suitable only for joining two lines of equal diameter and perfect for the tapered shockleader. How to tie: Twist the tapered leader and mainline (1) five turns opposing each other (2) and pass each end through centre of the turns in the opposite direction (3). Tease tight (4). Cut off ends (5). There is a chance the leader knot will catch your thumb or loops of line when you cast, so check it is to the right or left of the spool before you cast. There are a couple of ways to protect your thumb, and the simpler solution is a ‘thumby’ cut from a rubber glove. The second is to tape a flap of rubber to the rod below the reel seat so it can be used to grip the spool. If you fish with a fixed-spool reel, position the knot on the top of the spool and then it won’t catch on the loops of line and drag them off the spool. A tapered shockleader creates a small, tight knot which is ideal for fixed-spool reels as well as multipliers with a level-line.